I am thankful to call Taylor Dean my friend. She is a wonderful author and a sweet soul. I’ve read all of her books so far except this one which is on my list! 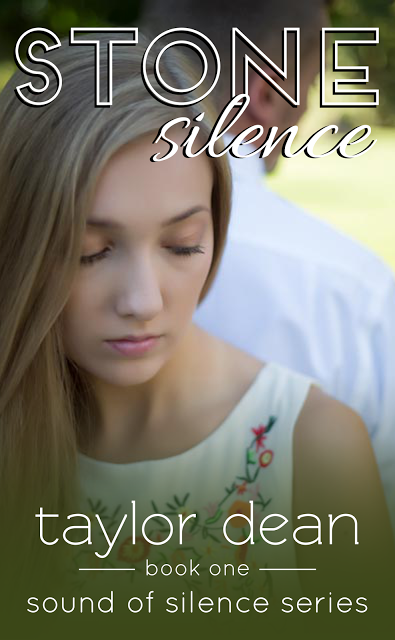 If you search my blog for Taylor Dean, you can find the book reviews I’ve done of her other books. Stone Silence is part of a three book series. He’s about as friendly as a rabid dog. I doubt there’s a prince hiding underneath his stern demeanor. Only a beast. Our eyes lock for a few moments. I implore him for help and I’m met with an unyielding gaze. I feel like I just ran into a rock wall. Hard. that’s my downfall. “Never mind,” I whisper as my voice cracks. The impending rain will save me. I’ll cup my hands and drink to my heart’s content. I’ll find someone else to help me. Surely there’s another house down the road. If there isn’t, it doesn’t matter. If I’m going to survive, I have to save myself. There’s no sign of compassion in this man. I cast a longing-filled glance at his motorhome and wonder if I can make a run for it and attack his faucet before Mr. Unfriendly even has the chance to get down from his ladder. My gait is wobbly and I falter. The buzzing in my head increases in volume. My head feels as though it has turned into one huge pulsing heartbeat. I don’t want to die out here. It strikes me as odd that I might die in the middle of the heartland because I couldn’t find anyone to help me. So much for friendship being the Texas state motto. Maybe they should remind their residents to act accordingly. my ear. Then the man says something unintelligible under his breath as his conscience gets the best of him. I hear that loud and clear. my face and I instinctively turn my head toward the heavens, hoping moisture will inadvertently land in my waiting mouth. Instead, the simple act of moving my head leaves me reeling and the lights go out as I fall to the ground in a crumpled heap. Thank you for sharing this post about Stone Silence, Christy! I consider you to be a friend as well and am grateful for your love and support.